The rise of mobile devices and explosion of apps has changed my mind on both counts. No small amount of ingenuity has turned rudimentary sensors on mobile devices into fledgling forms of physiological monitoring. Take iStethoscope for example, which uses the iPhone’s inbuilt microphone to generate an ECG trace based on heart sounds. Alternatively, Instant Heart Rate is an Android-based app that has made a very novel use of the camera; the user places her thumb over the camera and small changes in skin colour (associated with oxygenated blood) are used to determine heart rate. The adaptation of the camera and microphone that come as standard on mobile devices is not an answer in the long-term, but does make one wonder what kind of apps may be developed if a dedicated heart rate sensor were to be built into a mobile device. This is obviously a development under consideration at Apple who filed a patent for embedded heart rate assessment earlier this year. The probable introduction of physiological computing apps on a mobile device blows my first assumption out of the water – namely that systems would target users likely to be in stable and sedentary positions. The momentum seems to be in the opposite direction, to develop physiological monitoring apps as part of an exercise regime. In hindsight, my bias may be created by the fact that I’m a psychologist interested in physiological activity as representative of psychological states, and therefore, physical activity tends to create noise as far as I’m concerned. 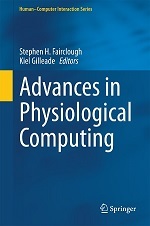 However, what physiological computing and mobile devices both offer is continuous and unobtrusive recordings. From the perspective of body blogging for various applications, the intensive data collection that may be demanded by this technology and pervasiveness of the hardware are a perfect fit. My second assumption about dedicated and integrated platforms for physiological computing systems does not fit with opportunistic, niche-seeking character of app development. As we’ve already seen, physiological data collection can be achieved in a number of ways and once these data are stored on a mobile device, it can be used to ‘feed’ any number of software systems, from health monitoring to mobile gaming. I believe the nature of app development means that a full biocybernetic loop (the cycle of information flow from data collection to software adaptation) will be achieved in a piecemeal fashion. One app to collect raw data, another one to do the relevant data analysis and a third to serve as a platform for software adaptation. For example, imagine an iPhone equipped with embedded heart rate monitoring – a data collection app would collect a raw ECG trace, a second app would extract a desired measure (e.g. heart rate, heart rate variability), whilst correcting for physical activity and artifacts in the data. This clean data would be passed on to a revamped version of iTunes that monitored your heart rate responses to every song played; the purpose of which would be to automatically create a ‘chill out’ playlist of tunes that slow your heart rate – that you could activate in stressful times. This is just one example of how apps could function as modular building blocks to create physiological computing loops on mobile devices and across different hardware platforms. The data provided by pervasive physiological monitoring has the potential to function as a common (information) currency across a range of related apps. This entry was posted in Musings, News and tagged body blogs, ecg, pervasive computing, telemedicine, wireless on September 7, 2010 by Steve Fairclough.